Unfortunately, there are no guarantees that your surgery will be without complications, as no surgeon or procedure is perfect in every way. You can, however, improve your odds of success by choosing an excellent Plastic Surgeon. First of all, your odds are increased by choosing a Plastic Surgeon Board Certified by the American Board of Medical Specialties (ABMS). There are many other makeshift “boards” who do not meet the ABMS standards. You can find the occasional surgeon who is competent without these qualifications but, again, you are playing the odds in your choice. In addition to qualifications, you should obviously meet both the doctor and his staff for a consultation and make sure you feel comfortable with both. You should choose a physician whose first concern is your health and well being and gives you advice that is reasonable, understandable, and realistic. Your doctor should inform you of any complications or limitations to any procedure you are considering in an honest and open fashion. Viewing before and after photographs is very helpful. Even talking to patients who have had the procedure can be easily arranged in our office. Also, pay careful attention to the administrative and nursing staff. They will play a key role in your care. Look for stability (how long have they been working at the office), compassion, and communication. You should also look into the quality of the surgical facility used and the qualifications of its staff. We use the Dallas Day Surgery Center and are proud to be associated with this unique and caring facility. We choose to perform our procedures here because of the quality staff and the care provided to our patients. After you have looked at all of this, you should choose the physician that makes you most comfortable and in whom you have the most confidence. If you would like to arrange a consultation, please contact us today. What Are The Dangers of Smoking in Cosmetic Surgery? The dangers of smoking will not be discussed in full detail in the paragraphs below; however, the purpose is to detail how smoking specifically interferes with cosmetic surgery. Most people are well aware of the risks of smoking with regard to lung cancer, oral cancer, and bladder cancer, to mention a few. However, I would like to address its devastating impact in the skin itself and the health of the skin after cosmetic surgery. In very simplistic terms, cigarettes contain harmful ingredients, which include nicotine and carbon monoxide. Nicotine causes vasospasm of the vessels. Vasospasm in simple terms is a contraction of the vessel, which causes narrowing and restriction of blood flow. Carbon monoxide binds oxygen and does not allow the oxygen that we breathe to be released into the areas that need it so desperately, such as the skin. That is why smoker’s skin is much more wrinkled and weathered than non-smokers, and their skin ages much faster because they simply deprive their skin of oxygen through the vasospastic effect of nicotine and the binding effect of carbon monoxide described above. On one hand this weathered skin looks more aged than the patient’s chronological age. Therefore, after successful cosmetic surgery, which can be highly successful in eliminating the gravitational and dynamic forces of age, the skin would detract from an otherwise good cosmetic outcome, due to the fact that the skin is in such poor shape, primarily exacerbated in many patients by smoking. If this is not enough, there is even a more dangerous effect of smoking with surgery. In any type of surgery the skin is incised and elevated, and its blood supply is decreased temporarily. In almost every instance, in healthy skin this temporary decrease in blood supply during healing is well tolerated. In fact, plastic surgery is said to be a constant battle of beauty versus blood supply. We can take skin, elevate it, and tighten it; however, we must keep it alive! This seems obvious, but it is really the art of plastic surgery. One can see that the effects of nicotine and carbon monoxide described above can take an otherwise healthy skin flap and cause such a decrease in blood supply that the skin will actually die. If this occurs, one can get full thickness tissue loss requiring prolonged healing, delayed healing, or even the use of reconstructive surgery with skin grafting and flaps to correct the deformity. This is certainly not the desired end point in cosmetic surgery. Therefore, it is my policy not to do abdominoplasty or face lifts on smokers. I tell all smokers that in every single case they will have a less satisfactory outcome than non-smokers; however, they will see improvement. I will do blepharoplasty procedures, full face resurfacing, breast augmentation, and other such surgeries that do not require large areas of skin elevation or undue tension. Therefore, face lifts, abdominoplasty, and breast reductions are much more risky in smokers. There are certainly some plastic surgeons that will perform these procedures on smokers, but my personal policy is that it is too risky, and even one full thickness tissue loss in a face lift or abdominoplasty patient is not worth the risk. This can occur in non-smokers, but it is extremely rare. Are There Different Types of Aging? In this informational age many people are well educated, informed, and know exactly what they want. This understanding is also coupled with an ever-increasing acceptance of plastic surgery. Open communication and comparison between friends has occurred in most of the patients that I see in consultation. However, what I discovered is that information between lay people and discovered over the Internet does not translate into true knowledge. Individual consultation is critical to sort out all the information the patient has gathered, or preconceived ideas. On the other hand, many people come in just saying they look tired or older, and can’t put their finger on exactly why. I would like to describe in general terms how the aging process affects us all, so as to better pinpoint the specific signs of aging and better understand what procedure may best be suited for you. In general, we age in three different ways by three different forces. I will take each one in order. Gravity is probably the most understandable of all the forces mentioned above, and is well known to all. As we age the elasticity and resiliency of our skin breaks down and the simple force of gravity takes over. There is a descent from north to south on our face, and on the lower face it is exemplified by the deepening of the nasolabial folds, or smile lines. Notice that I did not say the creation of smile lines. Every person has nasolabial folds and smile lines and this is simply an unavoidable human trait. However, the depth and laxity of these lines increases with age. A second finding is the obliteration of the jaw line by the collection of jowls. This descent keeps tissue up at the junction of the cheek and chin and creates jowls. The excess skin and muscle descends over the jaw line and collects underneath the chin on the neck, as exemplified by obliteration of the neck/chin angle and a collection of skin and muscle. This collection is also called a “turkey gobbler deformity”. It is important to realize that the skin is attached to the mouth area with very little intervening fat, if any at all. Over the lip and mouth, but lateral to the smile crease, there is a thicker layer of fat and underlying muscle layer called the SMAS that descends gravitationally with the skin. It is this layer that is elevated with my face lift technique to restore, uplift, and correct the gravitational changes described above. It should be noted that gravitational changes can only be adequately corrected by surgery. Any tightening caused by laser would have only temporary benefit and very minimal long-term effects on correcting the heavy gravitational changes that are seen. Many people notice the gravitational descent of the lower face that is below the eyes (lower face); however, they do not recognize that the brow or forehead itself descends the same as the lower face. One may notice that they have heavy eyes and may think it is excess eyelid skin, when in fact most patients have brow descent. The forehead skin descends over the upper rim of the eye and creates upper lateral fullness or a “heavy eye”. When people in their 40’s complain of looking tired, it is almost uniformly related to brow descent. It is amazing how little brow elevation is needed to restore a fresher appearance, and this upward elevation can be easily seen in a mirror by manually uplifting the lateral brows. Therefore I take great care not to over-elevate the brow. I want to avoid the “startled” or “surprised” look. Dynamic forces strongly contribute to the creation of wrinkles and the appearance of aging in the face. As humans we smile, laugh, cry, and go through a series of emotions. In Texas we squint and fight off the wind, and create wrinkles around our eyes as well. Disappointment causes us to frown and creates lines between our eyes. This constant animation by muscle contracture causes the skin to bend and simply creates wrinkles. We see those begin to develop around the lateral eyes, called crow’s feet, in our late 30’s to early 40’s, followed shortly thereafter by frown lines, or lines between the eyes near the bridge of the nose and the lower forehead. We can also see transverse horizontal creases in the forehead begin to develop in the early to mid 40’s as well. Smile lines naturally occur, but total obliteration of these lines is not only difficult, but unnatural as well. Other dynamic lines are the vertical lines formed around the mouth from pursing one’s lips. It is a common misconception that only smokers get these lines. That is certainly not the case, although in smokers it is clearly the most severe and difficult to treat. Dynamic lines can be addressed by causing the muscle to stop contracting. Botox® Cosmetic will do this very efficiently and is used primarily around the eyes and on the forehead to achieve dramatic results. The problem is that Botox is temporary, but is very well accepted among younger patients who are not ready for surgery and do not have gravitational descent. In fact, one must be careful when injecting Botox in the forehead of patients with heavy brows, as the resultant muscle paralysis may actually cause the brow to descend and cause an even heavier look. If that is the case, then the patient is clearly a candidate for brow lifting as well, as Botox will only eliminate the forehead wrinkles. Botox cannot lift the brow. However, I recommend Botox for the elimination and improvement of crow’s feet, as attempts to surgically remove the muscle can result in strange appearing eyes. The surgery is very risky when trying to surgically remove this muscle laterally. I think it is unnatural for patients to have total elimination of crow’s feet past a certain age, and believe it is better to soften these wrinkles rather than totally eliminate them. A brow lift will eliminate the transverse forehead wrinkles and the frown lines by approximately 90% and will do so in most cases permanently, as these muscles are almost totally removed in a brow lifting procedure. If done correctly this does not look awkward or operated at all. This softens the brow and gives it a very youthful appearance. Gravitational lines from the nasolabial folds are best addressed by a face lift, reversing the gravitational descent of the nasolabial fold, but no attempt is made to weaken the dynamic muscles of the lower face by Botox or surgical removal, as this would give the appearance of an asymmetrical smile. This would look very unnatural and awkward. Therefore, I do not apply Botox on the lips, as any mistake in this area can cause asymmetrical lip movements, which again is very noticeable in patients. I believe that these lines are best addressed through a combination of laser resurfacing and/or some type of filler to the trenches of these wrinkles. My preference at this point in time is fat, and I refer you to other material on this website. Individual consultation is also used to delineate my approach to certain fillers. My practice is in Texas, and this geographical area and Australia have the highest incidences of skin cancer known because we have such high sun exposure and high winds. The dryness of the skin, coupled with the sun damage, is a potent environmental agent to accelerate the aging process. Sun damage to the skin cannot be underestimated. It is cumulative and we obtain 80% of our sun exposure between the ages of 18 and 25 years of age. Although public education has improved the knowledge base of the dangers of sun exposure and has increased the use of sunscreen, most teenagers still feel that they are “bullet proof” and most of my patients have some degree of sun exposure and environmental factors that are evidenced on their skin. The evidences of sun damage include brown spots, broken blood vessels called telangiectasias, and premature fine wrinkling. This is seen over all the skin including the cheeks. Environmental skin damage cannot be addressed by redistributing the skin, or changing the underlying muscle. The skin itself has to be addressed, and that is why I have invested time and effort in my clinical practice to optimize skin care for my patients. Dallas Medical Skin Solutions and EpiCentre Park Lane are enormously well received because they provide medically based skin care. We choose products and services studied and proven to be effective through research. We continue to have ongoing research protocols on products, services, and lasers in an effort to provide our patients with the most up-to-date and effective treatments. I encourage all of my patients to get involved in our skin care program because it clearly enhances the results of surgery. Again, if the final facial cosmetic result is viewed as a painting, then the finished product is greatly influenced by the canvas. Many patients are afraid to have facial surgery because of an operated look. I believe that environmentally damaged skin corrected for gravitational and dynamic changes still looks abnormal. However, if we can restore the skin to its youthful appearance, then when it is placed in its more youthful position the entire picture looks appropriate and un-operated. 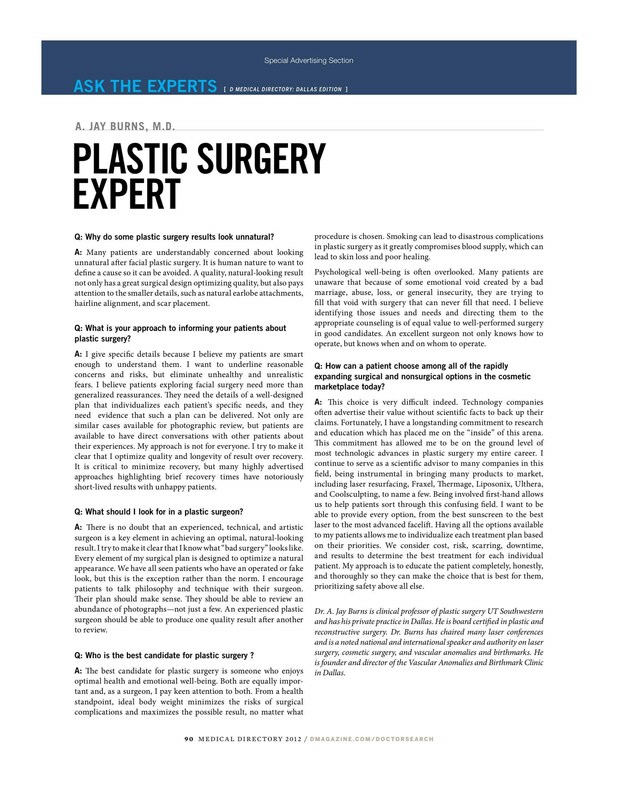 Many patients can avoid surgery altogether in their 30’s and 40’s by non-surgical approaches to skin care, either through aggressive skin care and/or non-ablative laser techniques which maximize improvement while minimizing down time and recovery. These techniques have been some of the most popular, if not the most popular, in our practice in recent years. They have greatly added value to our patients’ lives. For more severe sun damage, when skin care and non-ablative techniques alone do not suffice, resurfacing techniques such as laser, chemical peels, or dermabrasion are in order. I personally prefer laser treatment for this condition. I believe a certain depth of skin removal needs to be achieved, and I believe that laser can achieve that depth. “Ablation” means to remove the outer layers of sun damaged skin, which also stimulates a long term re-growth of new collagen which revitalizes and rejuvenates the skin. We reserve this for more severe patients, as the down time and recovery is increased when ablative techniques are used. Many patients with CO2 laser resurfacing had excellent results, but have weeks to even months of redness. We no longer use CO2 laser resurfacing in our practice, although most of our patients were very happy with the outcomes. We use the Erbium laser presently, which continues to yield excellent results and the recovery and down time is generally cut in half. Although reduced, the recovery for ablative procedures does need to be taken seriously. For significantly sun damaged skin, the results of laser resurfacing can be spectacular as compared to non-ablative techniques. In summary, aging is unavoidable and predictable. It is the result of gravitational descent, dynamic wrinkling, and environmental factors. In any consultation I try to define each one of these problems and individualize the treatment that will address each problem in the most efficient and predictable manner for each specific patient.